If you have ever had a conversation with me, you know I am obsessed with lemons and the idea of having a lemon tree in my yard! I love lemons. LOVE lemons. I like to squeeze a wedge into my water in the morning, grate zest into sauces, place slices on broiled fish, use the juice in a light salad dressing….you get the idea. 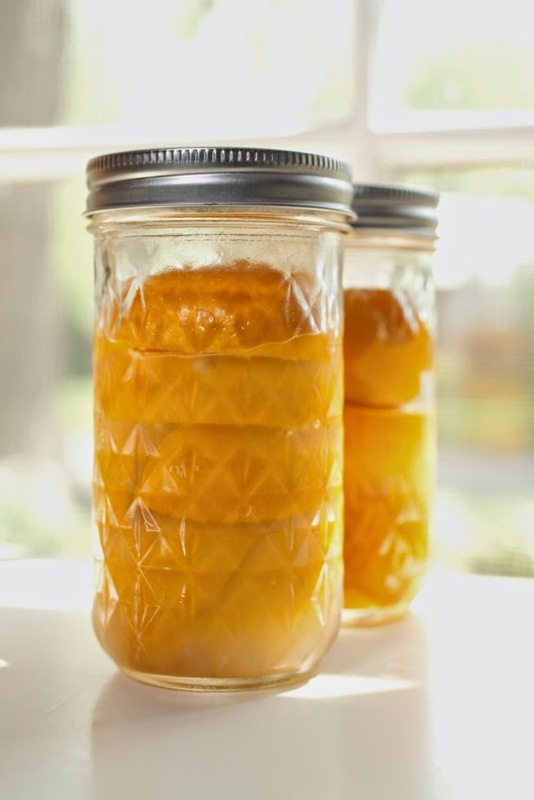 And lately, as I have been experimenting with new flavor combinations and styles, I have noticed that more and more recipes call for Preserved Lemons. They are not cheap. I believe they retail for about $10 for a 16 oz jar, however they are so easy to make. Lemons’ high nutritive content, especially ascorbic acid, helps to build the body’s immune system and ward off infection. Its digestive qualities help to ease indigestion, colic and nausea. Compounds in lemons are believed to decrease cancer risk. Lemon cleans the kidneys, acts as a diuretic, purifies blood and controls bile. I think they are magical. Many Moroccan and Middle Eastern recipes call for preserved lemons. They are used in tagines, soups and other dishes to provide wonderful lemon flavor. These preserved lemons are rich in lactic acid-producing bacteria, and, after the fermentation process is complete, both the flesh and rind of the lemon become edible. This recipe is simply lemons that have been pickled in salt and their own juices. Wash the lemons very well as you will be eating the rind. Place 2 tablespoons of salt at the bottom of a clean jar. Cut the tip that was attached to the tree off each lemon. Then, you are going to quarter the lemons, but without cutting all the way through them. So, cut the lemons as if you were going to cut them in half lengthwise, but leave about one-half to one inch of it connected at the base. Make another cut to quarter the lemon, but again, keep it attached at the base. juice is extracted. Continue this process, adding a tablespoon layer of salt between each lemon. If you finish, and not a lot of juice has come out of the lemons, juice a few and add the juice to ensure the lemons are completely submerged. At this point, you can add the optional cinnamon or other spice, depending on what you want the flavor to be. Then add 2 tablespoons of salt to the top of the jar and secure the lid. This can sit at room temperature for 3 weeks to a month. Turn the jar upside down every few days to ensure that the top lemons are submerged in lemon juice. 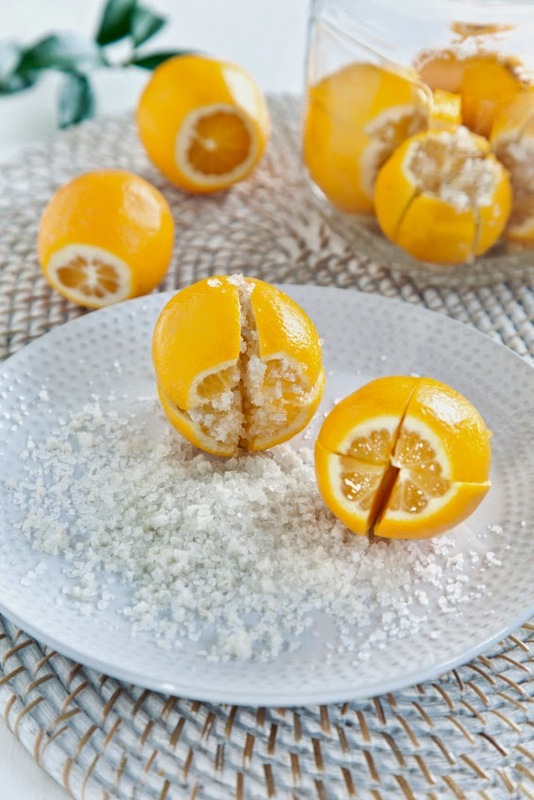 Once the lemon rinds have softened, you can store them in the refrigerator for up to 6 months. people discard the pulp and seeds, but if you like the pulp flavor, go ahead and use it. Welcome Liz 🙂 I think it is important to make sure that the lemon juice is covering the lemons at all times and to use enough salt. That should keep them from getting moldy. Good luck!